As early as when she was in secondary school, 25-year-old Elaiyarani Subramaniam found she had a real passion and interest in the subject. “In secondary school, I’d ask questions during Biology class that even my teachers couldn’t answer. I had to find the answers on my own,” she said. She found a programme suitable for her at Management Development Institute of Singapore (MDIS). MDIS, founded in 1956, is Singapore’s oldest not-for-profit professional institute for lifelong learning. It provides well-accredited courses, seminars and management services and opportunities for individuals to develop professionally through academic program in a wide range of fields, of- On track for a research career fered in collaboration with highly acclaimed international universities. Miss Elaiyarani gave credit to her lecturers for enriching her MDIS experience. “They're very encouraging and exceedingly qualified. Some of them held doctorates, while others practised medicine and had their own clinics. 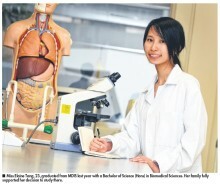 They made MDIS stand out,” she said. “The lecturers made themselves available to clarify every student’s doubts. “I often stayed back after every lesson to ask questions, and the lecturers were always very patient and encouraging. “They drove me to work hard and read materials beyond what was required.” Miss Elaiyarani needed all the support and encouragement from her lecturers before the start of her second year, when she was hospitalised and had to go through emergency surgery. 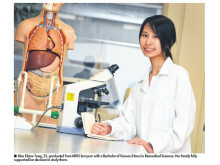 “Because of that, I had to miss almost a month of lectures and tutorials and rest at home,” she said. “While on hospital leave, I kept up with the lecture notes and continued studying, and consulted one of my teachers a lot regarding what was taught in class. “He really encouraged me. I was very motivated by him, and his support helped me score an A for that module.” Studying while being hospitalised required tremendous effort and discipline on her part. 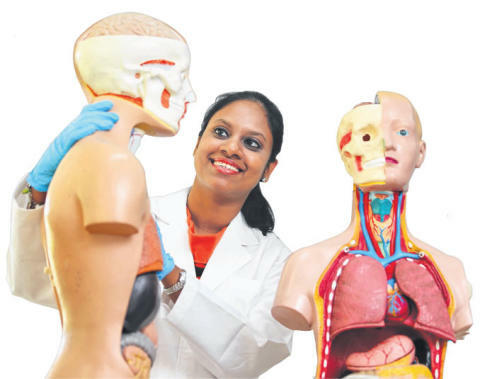 Bachelor of Science (Hons) in Biomedical Sciences (Specialisations in Medical Biochemistry / Medical Cell Biology / Cancer Biology) The course aims to develop a systematic understanding of the scientific basis of human disease. 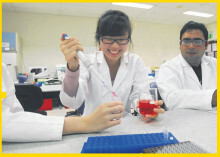 students will select, evaluate and appraise experimental and clinical laboratory techniques and apply them to experimental and laboratory investigations. They will prepare, process, analyse and interpret experimental and clinical laboratory data, and be able to evaluate and apply health and safety policies and good laboratory practices. graduates can do medical research in hospitals, universities, research institutes or pharmaceutical companies. Some become clinical scientists or medical laboratory scientific officers in hospitals, scientists in public health or forensic science laboratories, or join the food industry. Within the pharmaceutical and biotechnology industry, they can work as clinical trials coordinators and regulatory affairs executives. They can also work in medical information services, medical sales, and medical writing and publishing.